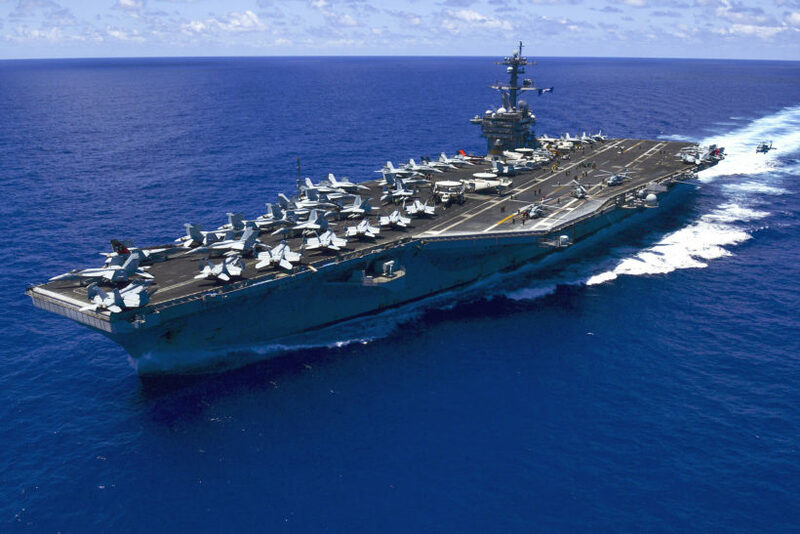 USS Carl Vinson (CVN-70) underway in the Pacific Ocean on 31 May 2015. (by David Morgan, Reuters) WASHINGTON — U.S. military strikes against Syria over its alleged use of chemical weapons are a warning to other nations, including North Korea, that “a response is likely” if they pose a danger, U.S. Secretary of State Rex Tillerson said on Sunday. As a U.S. Navy strike group headed toward the Korean Peninsula, Tillerson said China agrees that action is necessary to address North Korea’s nuclear arsenal, following last week’s meeting between U.S. President Donald Trump and Chinese President Xi Jinping. President Trump will soon review options for removing the “threat” posed by North Korean missiles, White House national security adviser H.R. McMaster said on Sunday. Reuters was first to report on Saturday that the Navy strike group USS Carl Vinson, whose flagship is a nuclear-powered aircraft carrier of that name, will make its way toward the Korean peninsula from Singapore as a show of force after Pyongyang tested a liquid-fueled Scud missile this month. “It’s prudent to do it, isn’t it?” McMaster said of the deployment on Fox News Sunday. “This is a rogue regime that is now a nuclear-capable regime, and President Xi and President Trump agreed that that is unacceptable, that what must happen is the denuclearization of the Korean Peninsula,” he said. A U.S. national security review of options on North Korea include economic and military measures. But they lean more toward sanctions and increased pressure on Beijing to rein in its neighbor. 3. China is an ally of North Korea. What attitude did Secretary of State Rex Tillerson say China now has toward North Korea’s nuclear weapons? 4. How did Secretary Tillerson reply when asked by ABC News if the U.S. military strikes against Syria following President Assad’s use of chemical weapons on civilians was also a message to North Korea’s Kim Jong Un? 5. What did Secretary Tillerson tell CBS News about the Chinese president’s view of North Korea’s missile testing? 6. a) What latest action have North Korean officials threatened to take in the near future? b) How is the U.S. responding to these North Korean threats, according to the NSA advisor? 7. Re-read paragraph 7. The reporter inserted his opinion into this paragraph by using quotation marks around the word threat. Why is this bias? Ask a parent: Do you think the Trump administration is taking the right steps to stop North Korea from further missile tests, threats and nuclear weapons’ development? Please explain your answer.